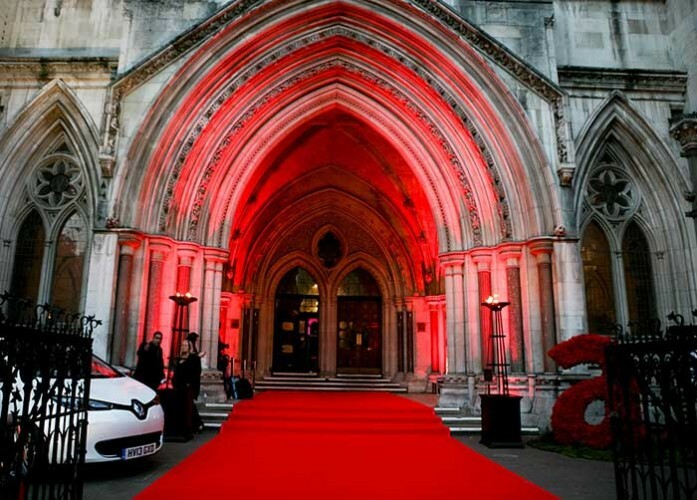 Kent, UK based Eclipse Presentations created a stunning production design and supplied the full technical package to realize it for the 2013 Attitude Awards staged on Tuesday at the Royal Courts of Justice in London. Hosted by Matt Lucas and produced by Attitude, the UK’s award-winning and number one gay magazine in association with Virgin Holidays, the glamour and the glitz was in full flow! Eclipse’s production manager Andrea Witt and project manager Nikhil Shah worked closely with Attitude Magazine’s show producer Annie Bracken and Seasoned Events to ensure that everything ran like clockwork on the night and that the setting and environment helped make it a memorable night for guests. The gala dinner and awards ceremony saw a star-studded line up of celebrities rock up, to see the likes of Daniel Radcliffe, Paul O’Grady and Cher collect their coveted Awards, together with a special guest appearance by chart-topping singer, Ellie Goulding. The many challenges of the day included an exceptionally tight timeframe. Three trucks of equipment - staging, sound, lighting, video, all the furniture etc. – had to be loaded into the RCJ between 4 and 5 a.m. on the day. Between 5 and 8 a.m. the Eclipse crew of 22 – including technical, riggers, carpenters and locals – built and installed what they could. No cables could be run and no trusses or stands rigged above a certain height, leaving a large amount of kit having to be stored discreetly. Work then had to cease completely, while the law courts operated as normal for the day. The crew returned at 5 p.m. and had 90 minutes working furiously to complete the rigging, wiring, testing, etc. and have the spaces – Main Hall, Reception area and Red Carpet - ready and looking fabulous in time for a 7 p.m. rehearsal and sound check, followed immediately by doors. It was a slick operation with everything having to happen in sequence to maximize the time for all departments … as it pieced together like a giant jig-saw puzzle. As the RCJ is also a Grade 1 listed building, extra care was taken to ensure that nothing was touching any of the walls and the floors were fully protected with plinths underneath the lighting and PA stands, etc. 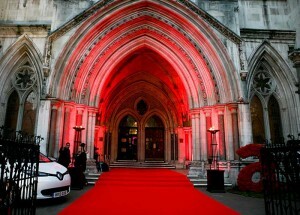 The exterior of the building was up-lit in stunning red (for Virgin) using Core battery operated LED uplighters. These also blended tastefully with the RCJ’s own architectural lighting scheme, picking out the detail of the splendid Victorian era Gothic Revival style building. The majestic internal entranceway arches were also lit by Eclipse using the same fixtures. Guests sashayed down the red carpet area into the foyer for the drinks reception. While guests were eating dinner end enjoying the Awards razzamatazz, the Eclipse team worked frantically to transform the Reception into a buzzing Aftershow space, complete with full DJ set up and sparkly booth surround, a 20 x 20 ft dancefloor, a host of bubble sofas and cool soft white furnishings and extra lighting effects. 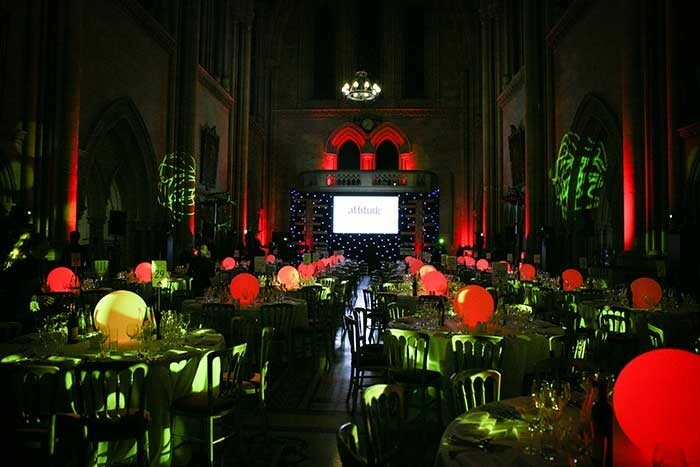 The venue for the second Attitude Awards was deliberately chosen for its stunning architecture so it was important to make a real visual impact in the Main room. An 8 metre wide by 3 deep stage was built for the presentation, complete with an RGB Chameleon starcloth backdrop and two three-metre tall vertical ‘glitter disks’ positioned just downstage of this. These provided a funky set and plenty of camera candy for the IMAG relay of the Awards. There is no flying in the venue, so lighting and audio speaker positions were all facilitated using stands. Lighting designer Andy Emmerson used 18 moving lights – Martin MAC 700 Profiles and Washes and Clay Paky Alpha Spot 800 QWOs to illuminate the stage and table areas. ETC Source Fours with breakup gobos provided a further subtle lighting layer for the tables, and 1k Fresnels and more Source Four profiles created the basic stage washes. The striking pillars running the length of the room were up-lit with more Core wireless LED fixtures. A d&b sound system was installed consisting of E9 speakers with B2subs, powered by d&b D12 amps and proprietary processing and another separate complete d&b system was set up in the Aftershow, utilizing Q7 speakers and Q-SUBS. Video elements in the Main Room included front projection, using a Panasonic 20K HD projector onto a centre stage screen and plasma delay screens were rigged at the rear of the hall to ensure that all guests had a good view of the onstage action.